I don’t have the time right now to translate this post into Jamaican. Sorry to disappoint those of you who look forward to reading Jamaican. But I’ll do it for next week when I’ll be under a little less pressure. Frederic Cassidy and Morris Cargill were white Jamaicans whose responses to the culture of the black majority reveal radically different mindsets. Morris Cargill suffered from a terrible superiority complex. He was an opinionated newspaper columnist and lawyer who had absolutely no respect for local intellectual traditions. Frederic Cassidy was a gentleman-scholar who contributed in great measure to the academic life of the Caribbean and far beyond. As a professor of Linguistics at the University of Wisconsin, Madison in the 1960s, Cassidy led the research project that resulted in the publication of the multi-volume Dictionary of American Regional English. For more than forty years, Morris Cargill used his column in the colonialist Gleaner to batter black people. He couldn’t have gotten away with it in the U.S., Britain or any mature democracy. But this is Jamaica. Racism is cute. Cargill took perverse pleasure in preaching the gospel of the natural inferiority of African people to Europeans. Cargill, ever provoking, once wrote a newspaper column headlined, “Corruption of Language is no Cultural Heritage.” He seemed to be claiming that African peoples and our languages are sub-human. And the Caribbean Creoles that developed out of the many African languages brought over in the heads of our ancestors are nothing but monkey talk. I was so vexed when I read that column, I had to reply: “Cho, Misa Cargill, Rispek Juu!’” I decided to answer Cargill in Jamaican, the very language he was dissing. And I used the writing system for the language that had been developed by Professor Cassidy. A horse of a different colour. Frederic Cassidy celebrated the verbal creativity of the black people among whom he grew up. His book, Jamaica Talk: Three Hundred Years of the English Language in Jamaica, which was jointly published in 1961 by the Institute of Jamaica and Macmillan in London, is a labour of love. It is true that the subtitle of the book plays down the African elements in our language. By the way, I prefer the nationalist label ‘Jamaican,’ rather than the academic ‘Creole’ or the much more popular ‘patwa.’ But whatever name you call it, the language clearly has African features, which Cassidy does acknowledge. In collaboration with the equally distinguished linguist, Robert LePage, Cassidy produced The Dictionary of Jamaican English. Published in 1967, the dictionary is still not widely known here. The prohibitive cost was a factor. Thankfully, as a result of my initiative, Cambridge University Press sold the paperback rights to the University of the West Indies Press. The cost of the dictionary has been greatly reduced. Every single Jamaican school can now afford to put The Dictionary of Jamaican English in its library. Many of our Jamaican words come straight from West Africa. Asham. The original word in Twi, one of the languages of Ghana, is ‘o-siam.’ Look it up in the Dictionary if you don’t know the meaning! Then you might think that the word ‘mirazmi’ is African. You’ll discover that it’s actually Latin, ‘marasmus.’ And, would you believe it, the word ‘cashew’ entered the English language via Jamaica. 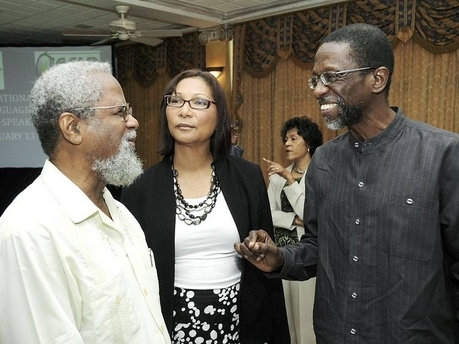 The historic conference on “Language Policy in the Creole-Speaking Caribbean” that was convened last week by Professor Hubert Devonish, Head of the Jamaican Language Unit at the University of the West Indies, Mona, was a huge success. The conference brought together, from across the region, ministers of government (present and past), representatives of various educational and cultural institutions, civil society activists and linguists, of course, on a mission to spread the word on the power of our local languages. Blissful ignorance – of the Morris Cargill variety – often masquerades as fact. Or playful satire. Genuine scholarship reveals the true face hidden beneath the grinning mask. 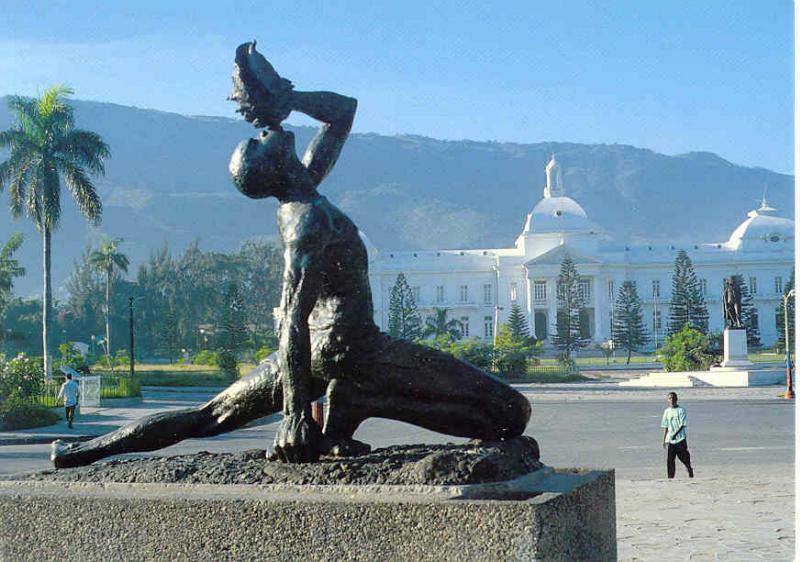 On the eve of the historic University of the West Indies conference on “Language Policy in the Creole-Speaking Caribbean,” I have to tell the story of the upsetting experience I had last year in a Resident Magistrate’s court in Jamaica. I was there representing myself as the defendant in a case against an unscrupulous supplier of windows who had sued me for refusing to pay for defective windows. Believe it or not, he had conceded that the windows were substandard. But he intended to refund my deposit only if I agreed that he could remove the faulty windows within a month or so. If I did not let him remove the windows within that narrow time frame, I would be forced to purchase them! Since he had taken almost 5 months to install windows that should have been ready in about 3 weeks, I considered his proposal completely wicked and refused to be pressured into buying sub-standard windows. I made it quite clear that I needed time to decide on alternative windows and then to have them manufactured. Refusing to bow to reason, the unconscionable man proceeded to sue me. I won the case but wasted a lot of time in court. All the same, I learnt a lot about deaf, dumb and blind ‘justice’ in the Jamaican courts. One morning, as I waited for my case to be heard, I listened in amazement as the judge explained in quite sophisticated English how she was proposing to handle a dispute about unpaid rent. The defendant was told that the case was going to be sent to a mediator who would discuss exactly how much rent the defendant would have to pay. The distressed defendant kept on insisting in Jamaican that she didn’t owe as much rent as the landlord claimed. The judge continued speaking in English, simply repeating her proposal. This back-and-forth went on for a good few minutes. Surely, the judge should know that justice cannot be dispensed in a language that the defendant does not understand! What bothered me is that the judge must have realised that the defendant did not understand her. But it did not occur to her that she needed to use “that” language, Jamaican. That same day, the stubborn judge refused to acknowledge the fact that another defendant had not understood her ruling. In this case, the plaintiff did not appear in court and so the case was dismissed. But the poor defendant, who did not understand that he was free to go, sat in the court for another hour waiting for the case to be tried. I was so vexed, I again jumped up and asked the judge why she would not make it clear to the man that he was free to go. I couldn’t believe it when she said that she had told the man he could go and if he wants to sit there it’s his business! It clearly didn’t matter to her that the man did not understand. That was his problem, not hers. I took it upon myself to tell the man that he’d gotten off. And he quickly left the court. Now this is a judge who considered it appropriate to dress me down because, in her opinion, I was not properly dressed for court. On yet another court appearance, I considered myself dressed to kill in a kris white linen pants suit. I couldn’t believe it when the judge declared that my pants were mid-calf, and this was not acceptable. I excused myself and went into the corridor. I unbuttoned my pants, got them to drop a good few inches and then hobbled back into court like those young men with their pants waist at their knees. Of course, I had to hobble very carefully because if the pants fell to the floor I would definitely be in contempt of court. The judge insisted that the extra inches made absolutely no difference. She pointed to one of the men and informed me that his pants length was the standard: the hem of my pants had to go right down to the floor. In complete frustration, I turned to leave the court when a police officer said to me, “Just tell her seh yu sorry!” I did, with much insincerity. I couldn’t believe it! A few inches of cloth was a bigger issue than making sure that the language of the courts is understood by all citizens. Hopefully, the long-overdue conference on “Language Policy in the Creole-Speaking Caribbean” will eventually result in a law that will protect the language rights of all citizens. The business of the courts, for example, must be conducted in Jamaican for clients who do not know English. This is natural justice, plain and simple. A tumura di big-taim kanfrans a go staat op a Yuunivorsiti a di Wes Indiis, we dem a go chat bout langgwij palisi fi di konchri dem iina di Kyaribiyan we taak Kriyuol. Taakin bout dat, mi ha fi tel unu wan stuori bout wapn tu mi iina wan Rezident Majischriet kuort iina Jamieka laas ier. Mi beks, mi beks, mi beks so til! Mi dida difen miself iina wan kies gens wan banduulu man we sel winda. Im suu mi chruu mi tel im se mi naa pie im fi im bad winda dem. Unu naa biliiv dis: di man admit se di winda dem no gud. Bot im no plan fi gi mi bak di moni mi pie dong – if mi no mek im kom tek out di winda dem likl aafta dat. Bout wan mont im waan gi mi. If mi no mek im kom kwik-kwik fi tek im spwail winda, im a go mos an boun mi fi pie fi dem! Wel, sins im did tek aalmuos 5 mont fi put iin di winda dem we im did se uda redi iina 3 wiik, mi nuo se im wikid. An mi mek op mi main se mi naa mek im presha mi fi bai im buogos winda dem. Mi tel im se mi ha fi disaid mi main wa kain a ada winda mi waant; an mi ha fi wiet fi huusueva a mek dem tek dem taim. Di ankanshanebl man naa tink chriet an im rosh go suu mi. Mi win di kies bot mi wies nof taim a kuort. Stil far aal, mi laan uol iip bout ‘jostis’ iina Jamieka kourtous. ‘Jostis’ def, dom an blain. Wan maanin, mi a wiet fi mi kies kaal. Mi kyaan biliiv it wen mi ier di joj a yuuz som big wod fi eksplien ou shi a do diil wid wan kies we di piipl dem a kwaril bout rent. Di joj tel di uman we uoa rent se shi a go sen di kies to wan ‘mediator’ fi disaid omoch rent shi fi pie. Di puor uman kip aan a tel di joj se shi no uoa di uol iip a big moni we di lanlaad se shi uoa. Di joj shi dis a gwaan brandish di big wod dem; an di uman naa gi op fi ar kies. Dem gwaan bak an fort kopl minits wel. Dat siem die, di haad-iez joj rifuuz fi admit se wan neks difendant neva andastan ar jojment. Ier ou dat wan go! Di man we a suu neva kom a kuort. So di joj chruo out di kies. Di puor difendant neva andastan se im get we. So im sidong iina kourt fi bout a neks owa a wiet fi di kies chrai. Mi beks so til. Mi jomp op agen an aks di joj we mek shi no tel di man im frii fi go. Mi kudn biliiv it wen shi se sopn laik “I told the man he could go and if he wants to sit there it’s his business!” It no mata to ar se di man no andastan. A fi im prablem. A no fi ar. Mi mek it mi bizniz fi tel di man, “Yu get we!” An im waak outa kuort kwik-kwik. Nou, dis a di sed siem joj we wies taim a jres mi dong bikaa shi disaid se mi neva jres prapa fi kom a kuort. Dis taim, mi nuo mi jres tu pus bak fut iina wan kris wait linin pans suut. Mi kudn biliiv it wen di joj gi aaf se mi pans jrap a di migl a mi kyaaf an dat kyaan kom a kuortous. Di joj shii naa bak dong. Shi se di kopl inch naa mek no difrans at aal, at all. Shi paint pan wan a di man dem, an se fi im pans lent a di standad: di pans ha fi go rait dong a grong. Mi beks so til mi staat waak out. An wan poliis afisa se tu mi, “Jos tel ar se yu sari!” Mi dwiit, bot mi neva miin it. Mi kudn biliiv it! Kopl inch a klaat muor important dan mek shuor se evri sitizn andastan di langgwij we a yuuz iina kuortous. Aal mii uop is dat dis ya kanfrans pan langgwij palisi fi di konchri dem iina di Kyaribiyan we taak Kriyuol – we shulda kip lang-taim abak – a go chienj op tingz. Mii waan govament paas a laa fi protek di langgwij raits a aal sitizn. Wen yu go a kuortous di laaya an di joj dem supuozn fi chat mek yu andastan. If yu no nuo Ingglish dem fi taak Jamiekan. Dat a jostis fi chruu, plien an simpl. In 2010, there were 11 new posts, not bad for the first year! There were 49 pictures uploaded, taking up a total of 6mb. That’s about 4 pictures per month. The busiest day of the year was October 24th with 66 views. The most popular post that day was Maasa Gad Taak Patwa?. The top referring sites in 2010 were facebook.com, jamaica-gleaner.com, mail.yahoo.com, mail.live.com, and jamaicablogawards.com. Some visitors came searching, mostly for carolynjoycooper.wordpress.com, jamaica woman tongue, zahra redwood, yendi phillips, and pic of children doing outdoor play in jamaica.